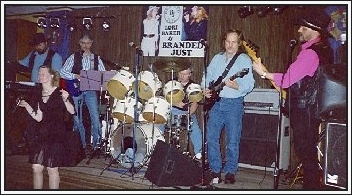 Formed in 1986, Branded Just is a popular and enduring fixture on the West Michigan country music scene. They are versatile, talented, and experienced musicians, with a repertoire of over 500 songs. With original songs comparable to anything heard on Top 40 Country Radio today, they've developed a growing entourage of loyal fans that follows them from show to show. Fans always know that they'll have a good time at a Branded Just show! The band's debut album, "Branded Just" features all original songs, and is available for sale at their shows as well as online. Their second album is currently in development. Their well-equipped and comfortable production studio, KING RAT PRODUCTIONS, is located in Sullivan Township, Michigan, and is available for bookings. The studio is currently being upgraded to add digital recording capability. Watch this space for information about equipment, facilities, services and rates. The band has performed at numerous charity events in the area, including the WMUS Cancer Drive, Toys for Tots, SIDS, and private benefits. The Branded Just Fan Appreciation Festival is an annual event sponsored by the band where they take time out to perform and visit with their friends and family in a casual outdoor environment.